Are Whiplash claims about to be consigned to history? This week, our Claims Director, Jody Thirkell, gives his thoughts on another key change for the insurance industry. Let us know your thoughts on the future of Whiplash claims by commenting on our Facebook, Twitter or LinkedIn. The new Civil Liability Bill is set to be introduced into legislation in April 2019 and could have far reaching consequences for the landscape of Road Traffic Accident (RTA) claims. The Bill proposes to significantly restrict the damages payable for whiplash injuries and also increase the small claims limit for RTA injury claims to £5000. Claims will also only be payable with supporting medical evidence. This will save insurers billions for minor whiplash claims but the increase of the small claims limit for RTA’s to £5000 may sound the death knell for these claims altogether. This increase will mean that solicitors would not be able to recover their costs from the defendant if damages are under £5000 and so their only option would be to take a percentage of the damages won. It is unlikely that firms of solicitors will see small whiplash claims as profitable business and will withdraw from the market altogether. Also, a large portion of claimants in person just won’t be bothered with the hassle for the sake of a £225 cheque. The whiplash culture and self-perpetuating industry it has created may be coming to an end, and many will not be shedding a tear at the news! If you’d like to discuss any future changes to insurance legislation, Jody and other key members of our team are happy to help. Simply give us a call on 0113 281 8110. Does it ever seem like stories about car theft in your local area are an everyday occurrence? If that’s true for you, maybe you live in one of Britain’s car crime hot zones. Recent research by MoneySuperMarket has revealed the 10 areas with the most car theft, and the 10 with the least. Surprisingly, major urban hubs such as Leeds, Manchester and Glasgow are missing from the list. You can see the full data below. It’s interesting to note that the midlands remains relatively quiet across both lists. 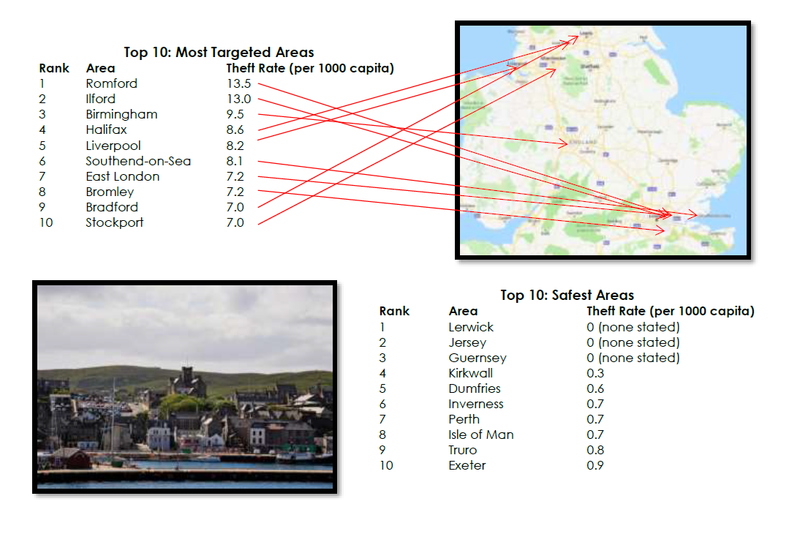 The worst areas and the best areas tend to be grouped, with the North West and London the two crime hotspots, and the south west, north Scotland and the channel islands remaining fairly car theft free. Romero Private Client insurance can help protect your most prized possessions wherever you are in the world. If you’d like to talk to us about the tailored cover we can deliver, call us today on 0113 281 8110. *Please note, these diagrams initially came from a PDF supplied by Robertson and Co.